As we travel on the Trans-Siberian train its day two, there is a blissfully perfect wintery snowy scene out of the carriage window and its time to turn our thoughts back to all the amazing things we have seen and done on this adventure so far. As we look back we find ourselves reaching for the brake pedal – slow down its going too quickly! 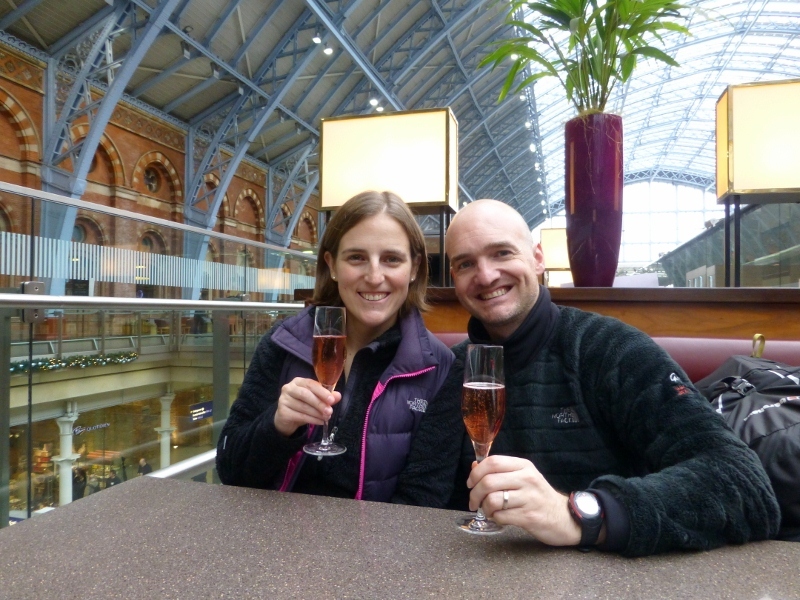 There is only one way to toast a big trip! The last few weeks before we went away were a whirlwind and before we knew it, we found ourselves on our first overnight train (just!). For those of you that read Dean’s earlier blog you will know that it was a close calls that testing my ability to run with my backpack from the offset!! Good job we had packed light! 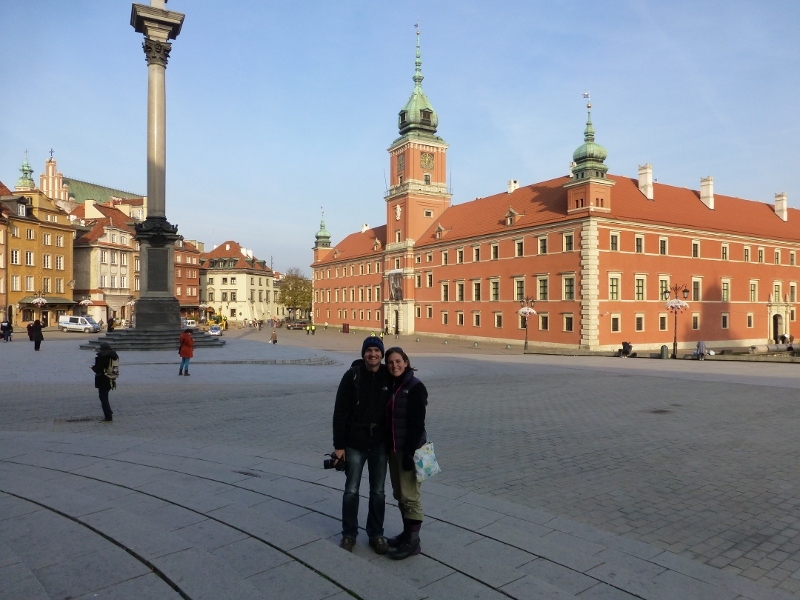 When we woke the next morning we have travelled through three countries – from the UK through France, Belgium, Germany, and finally into Poland. I remember Dean remarking that in many ways Poland was like the UK – full of Costa’s and Tesco’s! I can’t deny there were definitely similarities, yet it had a character all of its own that was an amazing introduction to the trip. Our day and night there would prove to be the first day where we walked our socks off and racked up the miles. As we got off our train, we walked out of the station and were greeted with the mighty sight of the Palace of Culture – a big imposing building that welcomed us. We discovered the ‘singing’ Chopin benches (that’s right – park benches that play Chopin music! ), explored the buildings in the old own square, walked the Old City Walls, had a Costa coffee (why change the habit of a lifetime?! 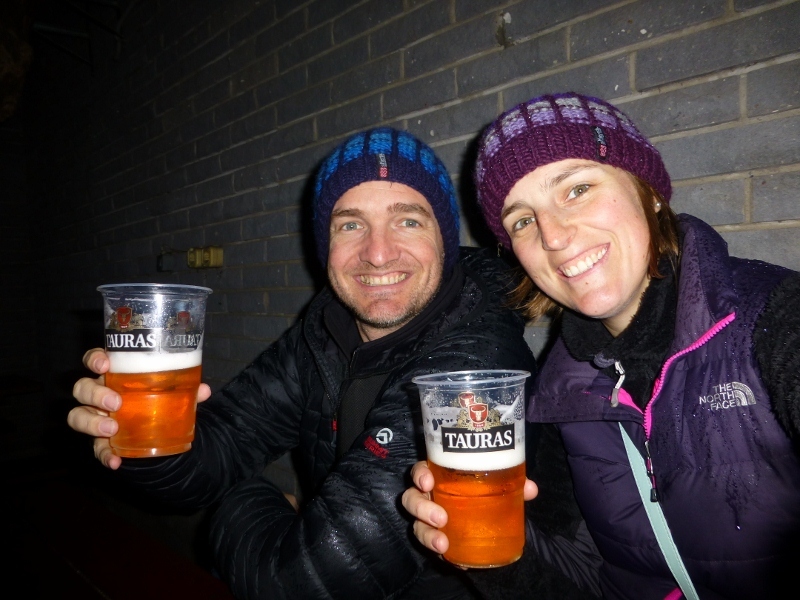 ), dashed down to see the Jewish Ghetto Memorial as the sun was setting and eventually toasted our arrival with a Polish beer – Nasdarovje! Our next journey was by bus (double axel as Mum spotted in the pictures!). It was possibly the poshest coach I have been on and came complete with cheesy chick flicks and aeroplane style entertainment system. True to form I chuckled away at a naff film!! 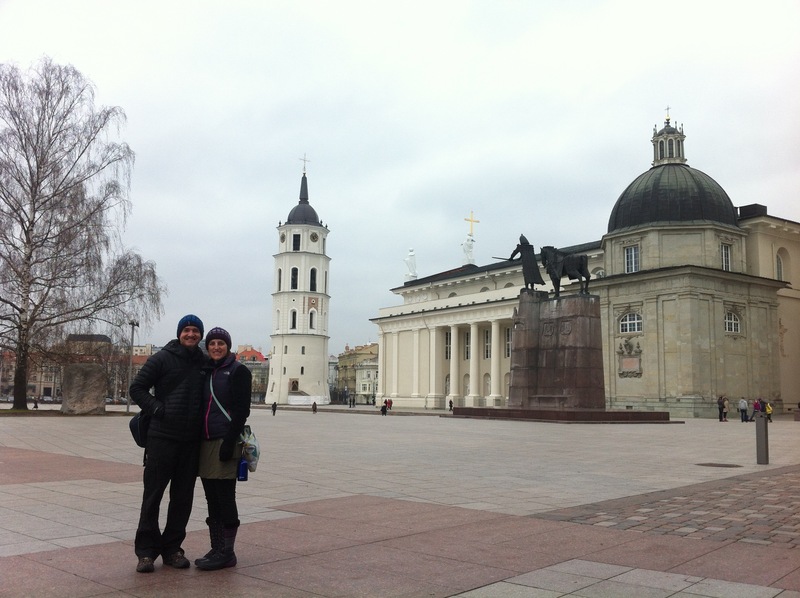 After an 8 hour journey, next came Vilnius and our journey into Lithuania. I had received many reports of what a pleasant city it is and it certainly lived up to that. Our hostel was just outside the old city walls, so a short walk and we were down in amongst the beauty of it – you can certainly see why it is UNESCO World Heritage listed. Lacking funds we had our first taste of noddles for dinner. We had a full day to explore and again we walked and walked. If this trip doesn’t tone my legs nothing will!! We walked up the main shopping street and down to the river where we meandered along the banks and came to the Green Bridge. Built in 1956 this is the only bridge in Lithuania that has statues on it. Given the adornment of statues on bridges in other cites this fascinated us! We then carried on and walked up the hill and went up the Gediminas Tower which gave us a brilliant view over the city. All too soon it was time to leave. On the way back to the hostel we came across this little local bar. It was basically park benches outside, and I convinced Dean that it would be good to have a drink with the locals. I was the only woman in there (apart from the lady behind the bar) but we paid our 50p and got our ¾ pint of beer. It was so good that we thought we’d invest in the economy and have a second!!! 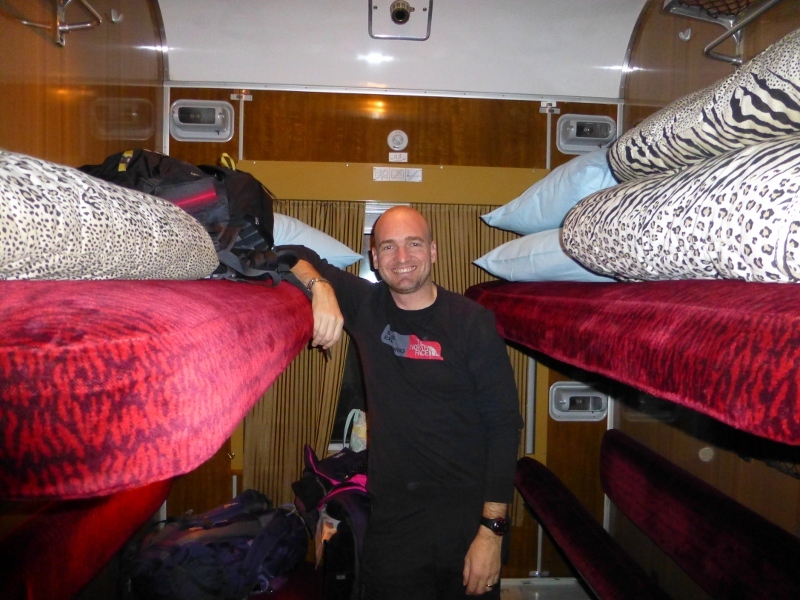 When we got on the train a couple of hours later, we were greeted with red velour beds and animal print blankets – it was almost like something out of a 1970’s dodgy film!! It is fair to say that crossing borders on a night train doesn’t make for a very restful night’s sleep. First our stop in Latvia and the Latvian border control where Dean got a stamp, and then an hour later came the Russian side. At 4am we handed over our passport and hoped for the best. To pass the time we had a midnight feast and tucked into our big bar of chocolate – bought to use up the last of our Lithuanian money and a great investment! Finally we were stamped in and rolling again, and next came awesome St Petersburg. 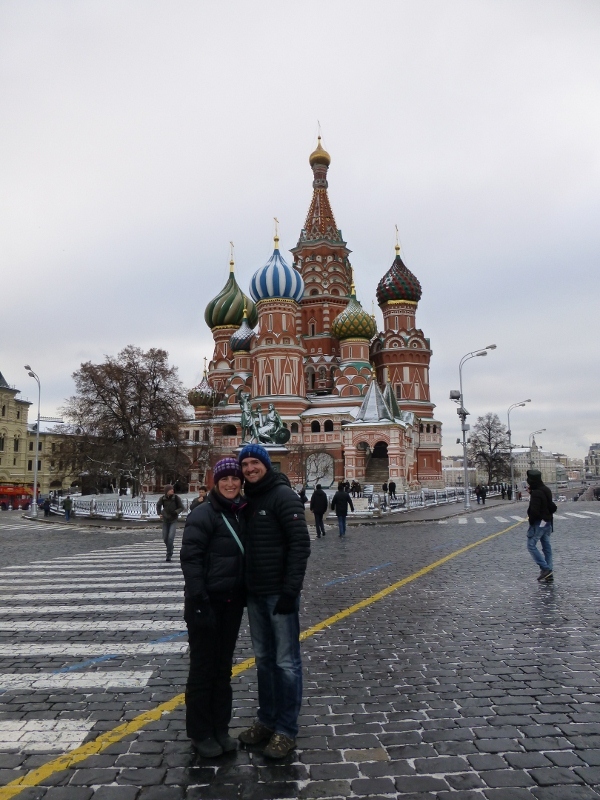 We spent the next three days exploring everything from the Hermitage to St Peter and Paul Island, St Isaacs Cathedral, The Church of the Spilled Blood (my first introduction to the ornate frescos), Udel Naya flea market as well as going to an Ice Hockey game – go SKA! We had planned to go to Swan Lake, but as it was too late in the season this made a nice alternative. We ended right on the edge with the opposing team so we had to keep cheering for SKA so there was no confusion as to who we were wiling on! It was no wonder the seats were both cheap and still available – no one else wanted them!!! It was a mammoth couple of days full of taking LOTS of pictures (both day and night). I couldn’t get over the amazing architecture everywhere – the buildings were just stunning and I was blown away. Definitely a city to come back to! 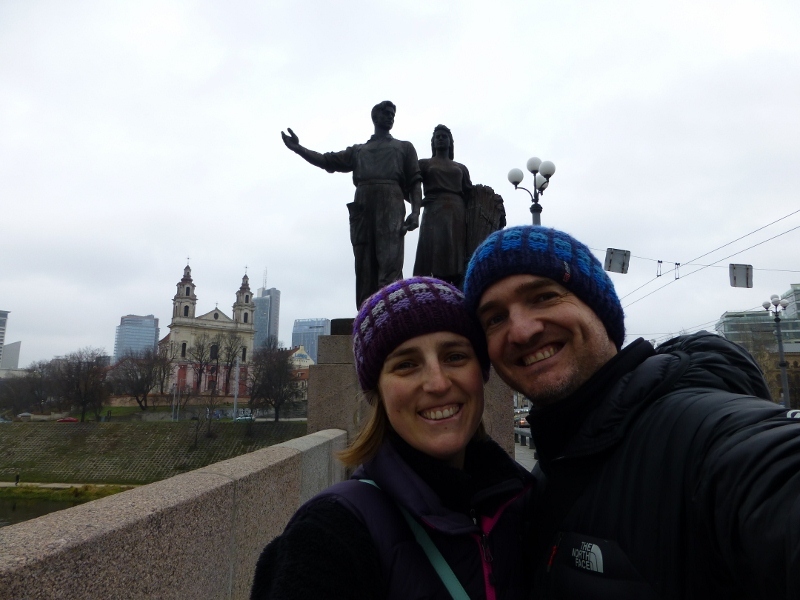 Our last stop was Moscow before the journey onwards. 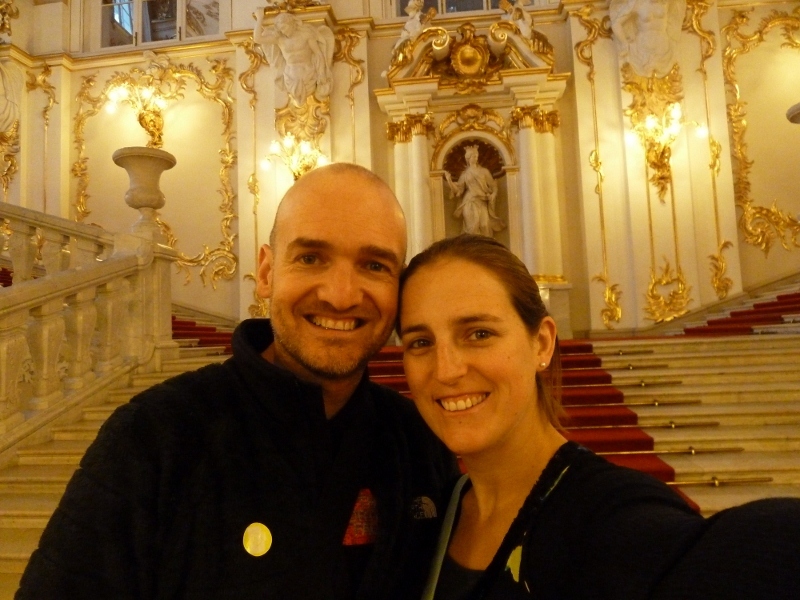 It had a lot to live up to for me as I’d loved St Petersburg. We took one of the German built express trains between the two cities, and arrived into Moscow at lunchtime. There is no denying that seeing St Basil’s for the first time is one of those real ‘I have made it moments’ and I was amazed by what I saw. It is the most stunning building and really does stand up to every expectation you have about it. We went inside and this amazed me too. I expected a big wide open space in there, instead it’s essentially lots of smaller chambers with the most beautiful frescos and artwork. Wow. The next few days were spent paying our respects to Lenin (I was the first of the day in there and had it all to myself which was very eerie! ), going round the Kremlin, visiting the Cathedral of Christ the Saviour, riding the Metro (Dean was amazing at navigating and we managed to sneak a few pictures) and going out to the old Communist All Russia Exhibition Ground. There was a really funky memorial to the Russian Space exploration out there which was quite unique. We loved our afternoon out there exploring lots of the old buildings and architecture. So as we got to the first of the ‘big train’ train journeys there was a small amount of sadness that we were saying goodbye to these amazing cities. It had been the perfect start to our overland adventure, and we were well and truly on our way! So what have we learnt? Successful travel as a couple is much easier if you a: tell the other person when you are hungry, b: tell the other person know when you are tired, and c: tell the other person when you are struggling! Follow these simple guidelines and you can’t go wrong! Above all, in the words of an advertisement in Warsaw…. ‘Life’s Good’!